When I first got the news I was going on exchange to India, the reaction I received from others was definitely different from the reaction I got when I found out I was going to Austria. Most people were aware that India is a lot different than the US, and the main concern from others was that I would be going there alone as a young woman. I shrugged off this recurring concern from friends and loved ones at first, but in my last weeks before leaving La Crosse I reached out to a few martial arts institutions in the area and took a short self-defense class, just in case. When I was still choosing which country I wanted to go to, some people also warned me that it might be hard to live in India as a feminist, and accept a country with such different views. So the burning question is – is India really as unsafe as people made it seem, especially for women? And how are women seen in society here? I will try my best to address this question here. This is probably the hardest blog post I’ve had to write, because I know many people (from India, America, and beyond) will be reading this and I don’t want to misinterpret or give false information on such a complex topic. As you read, please remember that India is a huge and diverse country, with vast differences depending on which part you are in. For example, the south of India is known for being a bit more ‘modern’ or liberal in its views toward women, compared to the North (I am situated in the middle, more towards the North). Also keep in mind that these are my personal experiences here, and might not be the same for everyone. Many factors go into each of the topics I’m going to discuss. Treatment of women can vary on a lot of things such as area, family, age, and even caste. 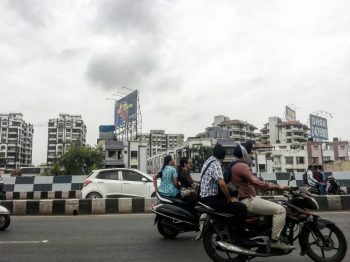 The city I live in, Surat, is generally pretty safe, at least in comparison to other big cities in India. There are different areas of the city, like ‘districts,’ and some are known to be safer than others. Unsurprisingly, the wealthier and well-educated areas are generally safer. In the first location I lived in, I was allowed to walk around alone, even in the evening and after dark while coming home from my evening dance classes. My second host, living in a different district, also has allowed me to do this without an issue. I never once felt scared, afraid, or threatened while walking alone here, but of course I’m still always aware of my surroundings and on guard. I also always dress conservatively and respectfully in public, no matter the weather. I don’t wear tank tops, low cut shirts, or shorts. I know the parts of the city I shouldn’t visit alone or at night, and my auto-Rickshaw transportation is normally done through a booked service (yes, there’s Uber for rickshaws) where my driver has the responsibility to take me to the right place. I do have a curfew, but it’s not too early and has never been a problem for me. I try not to be naive, because I know terrible things happen in India (and everywhere in the world, actually) but as long as I follow the precautions I mentioned, I feel quite secure here. I also know Rotary would not send me to a place which would be dangerous to me, and I try my best to use common sense to avoid potentially bad situations. I love many aspects of India, but one thing I’ve noticed here is more uniform behavior or lifestyle among women. There is a strong and distinct societal expectation placed on women. Of course, we have this in the United States as well, but with less pressure as many don’t follow it. The US allows for more individualism in this sense. Here, it’s expected to perform well in school, and many women move on to higher education as well. At some point they are married off (most marriages are arranged marriages which, as any Indian will tell you, are much better than they sound) and begin their married lives. From what I’ve seen, this consists of bearing children, staying at home while the husband is at work, taking care of the house and kids, and spending the day rolling beautifully round rotis and making home cooked meals and chai for the family. Of course there’s nothing wrong with this, and of course there are exceptions and many working and businesswoman here as well, but generally the gender roles are much more prevalent. 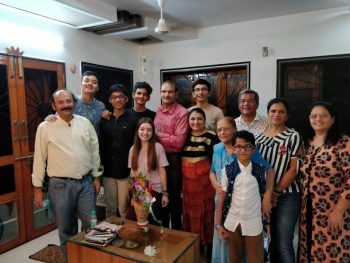 There is also an unspoken societal exclusion if these norms aren’t followed, as well as disgrace and bad reputation brought onto the entire family. Divorce or not getting married at all are looked down upon and generally not accepted. As long as women follow the societal guidelines though, there is no problem. A typical Indian wife’s day may consist of waking up early to perform puja (Hindu prayer at a home temple), cutting vegetables and preparing lunch, taking a nap for a few hours after lunch, running necessary errands, gossiping with the neighbors, making dinner, and watching Bollywood movies before bed. The fact that I’m even writing about this may be a little uncomfortable for some Indians, as this is somewhat of a ‘taboo’ and secretive topic here. However, for my western friends and family, this is a very interesting cultural difference which deserves to be mentioned here. If you know me, you know I am a very open person, especially about topics others are not as comfortable with. My openness has allowed me to feel comfortable with myself, my body, and its natural processes. However, many Indians see menstruation as something shameful, and women are generally considered ‘unclean’ during this time of the month. This is something that varies a ton from family to family in India. Some girls don’t go to school during this time, some aren’t allowed to touch certain things or enter the kitchen. While I personally never experienced anything this extreme, a few general rules prevailed for me. First and foremost, I am not allowed to enter or even go near a temple during the first four days of my period. This includes home temples, which are small sanctuaries of worship inside most Hindu homes. Trash produced during this week is also to be placed in a separate, discreet bag and disposed of in a discreet way. The discretion and secrecy of this just adds to the shame of something which is really just natural and normal in my opinion. Speaking of my opinion, that leads me to my final point. For those of you who aren’t good with definitions, feminism is basically the idea that women and men are equals and should be treated as such. This idea and movement is gaining momentum worldwide, and many youth are adopting it, acting on it, educating others, and hoping one day that gender inequality is a thing of the past. However, that is precisely the reason why things are moving a bit slower here in India. Indian civilization has been thriving for thousands of years, and the differing treatment of women has always been part of the culture, as well as social hierarchy in general. Many people here, often of the older generations, believe that this is India’s tradition and it shouldn’t be altered to fit new ideals. I try my best to understand this, but I also think some traditions are better left in the past, and evolving with society can bring good. And this is where the true exchange experience of culture shock and ‘what is my role here?’ comes into play. I have had conversations with people who genuinely believe that men are superior to women, and I have had to decide in the moment whether I should put in my two cents, or leave it be. While I can’t bring myself to ever verbally agree, in this situation I would just nod and try my best to understand the points the other person is making. After all, there are over a billion people in this country and I did not come here to change how an entire subcontinent thinks. As for the people who warned me it would be hard here as a feminist, I can definitely agree it hasn’t always been the easiest. However I have learned a lot and, once I accepted that I cannot change anything, it has become quite interesting to see the differences in how people think here. And don’t get me wrong – India is definitely changing..slowly but surely. Many of my local friends have been influenced by social media and feminist movements taking place in other countries, so the younger generation is much more liberal than their elders, and are fighting for change. It will be interesting to see how India evolves in future years. I really hope I did this difficult topic justice! On a lighter note, I have a lot more time on my hands lately and am considering making some videos where I freely answer questions and talk about my life here. If you have any questions for me about this post, or anything in general, feel free to comment them below or email/message them to me and I will make sure to answer them in a future video or blog. Thanks for reading! I apologize for my lack of blog posts lately! I’ve been very busy here, but I’m finally getting some time to myself since the school year ended and I completed my tours. We’re just entering summer now, so the climbing temperatures are probably also contributing to the slowing down of life here. 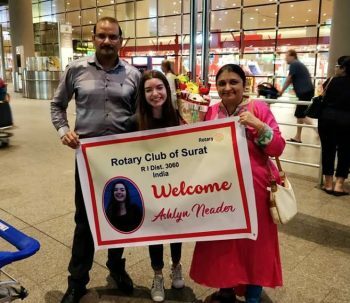 It’s already been 3 weeks since I returned to Surat from our 17 day trip through Northern India, and they were definitely some of the best weeks of my life. It was a dream to be able to spend two and a half weeks with the 18 other exchange students living in my Rotary district, and to see so much more of this beautiful, diverse country. The trip began with a 27 hour train ride (and a 3 hour bus ride after that) to reach Dharamsala, a Northern city in the Himalayas which is the residence of many exiled Tibetans and the Dalai Lama himself. Amazingly, we were able to witness a small part of one of his teachings, and got to see him up close. (He and I made eye contact!) The next city we visited was Manali, where we rented snowsuits and played in the snow. We stopped in Agra to see the Taj Mahal, and spent a few days in Delhi to witness India’s capital city in all its glory. Our next stops were in the state of Rajasthan, which holds India’s deserts. We visited forts in its capital city Jaipur (‘The Pink City’) and rode camels through the sand dunes in the Thar desert in the city of Jaisalmer. We spent two nights at a camp resort in the desert, staying in large tents in the sand. Finally we visited Jodhpur, the Blue City, and took another long train ride to our respective cities in Gujarat. Since it would be impossible to explain everything we did and how much fun we all had, I put together a short video compiling clips I took throughout the trip. I can’t believe it’s already been almost a month! It didn’t take long to get settled into life here, and I’m loving every minute of it. I’m still learning new things every day, but I’ve also gotten accustomed to most of the cultural differences that were so foreign to me a month ago. 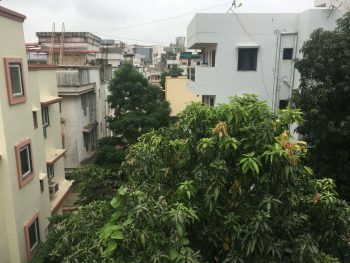 There are so many things I want to write about, but for now I’ll focus on my first impressions of India and the culture shock I faced upon arrival. After over 24 hours of total transport time, I arrived in India full of nerves and excitement. My wonderful host parents greeted me with a bouquet of flowers and incense, and a welcome poster. Surat, my host city, was another 5 hour car ride from Mumbai. As tired as I was during the car ride, it was hard to close my eyes to the new world around me. From my first step out of the airport, I could easily tell I wasn’t in Kansas anymore. Palm trees bearing coconuts stood tall everywhere I looked, along with many other species of trees I’d never seen in real life before. The street itself had several designated lanes, but somehow double the amount were in use. The road was shared between cars, rickshaws, buses, bikes, motor scooters, pedestrians, and, in some cases, cows or an occasional camel. Motor scooters weaved between vehicles and lanes, and pedestrians walked dangerously close to vehicles. There were no seconds of silence; everyone was honking their horns. At first observation, it appeared as if there were no road rules at all, besides generally keeping left. After one month here, it still appears as if there are no road rules, but I’m used to the chaos and I am even comfortable crossing the road by myself (after weeks of only crossing while holding my host mom’s hand). Food aside, the process of eating itself has proved to be a bit of a cultural difference. While silverware isn’t necessarily hard to come by here, it isn’t used by everyone. While I don’t want to compare my two exchanges, it became immediately evident that the controlled fork and knife etiquette I mastered while in Austria would be of no use here. As everyone here eats food with their right hand, I immediately switched to eating with my right hand despite having eaten with my left hand my entire life. This in itself was a challenge. Holding a spoon in my right hand feels much like writing with my right hand does: awkward and strange for the lefty I am. When a spoon or fork isn’t necessary (which is most of the time), meals are only eaten with the hands. I’ll talk more about foods and mealtime in India in a further post, but needless to say I’ve mostly mastered hand eating too. I won’t go into depths on toilets here, but I feel like I can’t talk about culture shock without at least mentioning them. It’s true that toilet paper isn’t super common here, and I packed my luggage accordingly. However, I’ve quickly grown to love the alternatives here! Pressurized water sprayers on the backs of toilet seats and handheld water sprayers accompany almost every toilet here, and they’re surprisingly effective. I should also mention that I have managed to avoid public toilets since arriving and have not yet had to pop a squat. Another culture shock I faced after some time has to do less with physical differences and more to do with the differences in how people here act. My whole life, I’ve been trained to say “thank you” whenever anyone does something for me, big or small, and that one can never say thank you too much. This actually isn’t true in India, as saying thank you (especially between family members) can create an unnecessary formality and distance between people. This seems to also be the case for “sorry” and “please.” These terms are still used sometimes, but aren’t necessary in every situation. Although I understand the cultural difference and am trying to adapt to it, I still cringe at myself every time I simply say “no” or “yes” instead of “no, thanks,” or “yes, please.” Hugs and physical affection here are also not common. Because of these reasons, I’ve been having trouble trying to express my gratitude! I’ve been so busy between school, Rotary events, and different two traditional Indian dance classes that I haven’t had much time to sit and write, but today was the first day I’ve seen the sun since coming here since it’s currently monsoon season. Pretty much every day has been cloudy and in the upper 80ºs, with on and off showers. I took advantage of the sun by sitting on the roof of my house with some incense, chocolates, good music, and my laptop to write this blog! This first month has been one of the best of my life! Every day is full of new experiences, rich culture, extremely friendly people, great food, and, as cliche as it sounds, self-discovery. I’m so excited to see where this year leads me!! Thank you all for following me on my journey! Don’t forget to follow my Instagram @ashlyns.exchangeyear for frequent pictures AND don’t hesitate to contact me if you have any questions or want to chat! I’m writing this blog from the Chicago airport during my 6 hour layover here. I want to write about what I’m feeling, but I’m not sure I can summarize it, or even put the feeling into words. Regardless of this being my second exchange, I’m still nervous and even a little scared. Stepping into the unknown, away from everything that’s familiar to you, is no easy task. It’s been half a year since I found out I’m going to India, but the reality only started to kick in about a week ago. I’ve gone through every emotion in the last week, and sometimes several at once. One minute I’m so inexplicably excited, and I feel my heart skip a beat every time I think of India and the culture, sights, and adventures I’m about to experience. The next minute I doubt myself, and feel nervous about the unknowns that lie ahead of me. There’s something extremely nerve-wracking about knowing next to nothing about the next year of your life. I don’t want to fear it. The fear creeps up subconsciously. I know there’s no use in fearing the life ahead of me, because I can’t turn back now. Besides, I’m more excited than I am nervous. The prospect of living a new life, making new friends and meeting new people, learning a new language, and experiencing a completely different culture is exhilarating. I’ve spent a large portion of this long layover watching vlogs from past exchange students who went to India, and learning little bits of Hindi. With every picture or video I see of the country I’ll soon call home, I feel an excitement I can’t describe, and my fears and doubts melt away. Up until my first flight I had mixed emotions that came in contradicting waves. Now that I’m on my way there, with 27 more hours of travel ahead of me, I’m ready to arrive at any time. I’m as ready as I’ll ever be, and my phase of stressing is over. It’s time to embrace this opportunity and this life. Enter your email if you want to get a notification when I write a new update on my exchange!